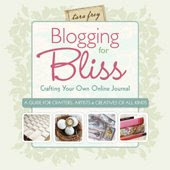 I am so excited and honored to be able to say that I was one of the 50 bloggers chosen to be in Tara Frey's new book "Blogging for Bliss: Crafting Your Own Online Journal, A Guide for Crafters, Artists & Creatives Of All Kinds" due out August 4th! I can hardly wait to get my copy and start enjoying each and every page. You can read more about this wonderful book here! And pre-order your copy from Amazon or Barnes and Noble. It will be available at your local bookstore August 4th! Also, don't forget the giveaway going on for "Love One Another". Post a comment between now and May 2nd at 12:00 midnight and I will be drawing a name and sending it to someone. Thanks for all the beautiful comments left, they brought tears to my eyes reading each comment. Thank you! How cool is that??? You must be on cloud 9!!! Congrats my dear...you deserve it. CONGRATULATIONS! I'm so proud to be working with such talented artists! Thank you for your warm words - I'm grateful to know you. Can hardly wait to see the book! That is so wonderful Sheila! Can't wait to see your feature when it comes out! I'm so happy for you...What exciting news...I bet you're so happy..